The cell membrane (also known as the plasma membrane or cytoplasmic membrane) is a controls the movement of substances in and out of cells. The basic function of the cell membrane is to protect the cell from its surroundings. It consists of the phospholipid bilayer with embedded proteins. Cell membranes are involved in a variety of cellular processes such as cell adhesion, ion conductivity and cell signalling and serve as the attachment surface for several extracellular structures, including the cell wall, glycocalyx, and intracellular cytoskeleton. Cell membranes can be artificially reassembled. 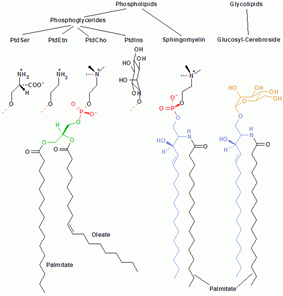 The fatty chains in phospholipids and glycolipids usually contain an even number of carbon atoms, typically between 16 and 20. The 16- and 18-carbon fatty acids are the most common. Fatty acids may be saturated or unsaturated, with the configuration of the double bonds nearly always "cis". The length and the degree of unsaturation of fatty acid chains have a profound effect on membrane fluidity as unsaturated lipids create a kink, preventing the fatty acids from packing together as tightly, thus decreasing the the fluidity of their cell membranes by altering lipid composition is called homeoviscous adaptation. The cilia, which are microtubule-based extensions covered by the cell membrane, and filopodia, which are actin-based extensions. These extensions are ensheathed in membrane and project from the surface of the cell in order to sense the external environment and/or make contact with the substrate or other cells. The apical surfaces of epithelial cells are dense with actin-based finger-like projections known as microvilli, which increase cell surface area and thereby increase the absorption rate of nutrients. Localized decoupling of the cytoskeleton and cell membrane results in formation of a bleb. The apical membrane of a polarized cell is the surface of the plasma membrane that faces inward to the lumen. This is particularly evident in epithelial and endothelial cells, but also describes other polarized cells, such as neurons. 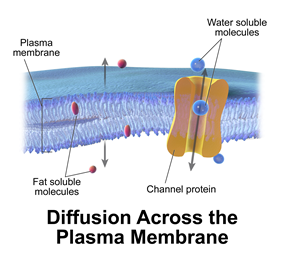 The basolateral membrane of a polarized cell is the surface of the plasma membrane that forms its basal and lateral surfaces. It faces outwards, towards the interstitium, and away from the lumen. Basolateral membrane is a compound phrase referring to the terms "basal (base) membrane" and "lateral (side) membrane", which, especially in epithelial cells, are identical in composition and activity. Proteins (such as ion channels and pumps) are free to move from the basal to the lateral surface of the cell or vice versa in accordance with the fluid mosaic model. Tight junctions join epithelial cells near their apical surface to prevent the migration of proteins from the basolateral membrane to the apical membrane. The basal and lateral surfaces thus remain roughly equivalent|}} to one another, yet distinct from the apical surface.